An integral part of the filtration system, the centrifugal pre-filter decreases water waste by dereasing the frequency of backwashing required. Best Price Pool Equipment stocks a range of centrifugal systems to complement our extensive selection of cartridge filters. Contact Nicole today for more information on which cyclone system will best suit your pool. Filters up to 80% sediment coming into the system, easing the workload for the cartridge filter. Maintains flow rate even with increased sediment input. Relieves the heavy burden normally placed on pool cleaners. Amplifies the performance of the cartridge filter and pool cleaner. Centrifugal water pre-filters basically clean the water before it gets to the cartridge filter. Designed to filter heavy sediment from water, the centrifugal filter employs a basket and a porous material known as a ‘filter cake’, which are placed inside a cylinder. Water passes through the spinning basket inside the cylinder, the centrifugal action separates the sediment (slurry) and liquid. The build-up of slurry is too large to penetrate the cake, however, the liquid passes through easily, into a cartridge filter and flows back into the pool. Twice-filtered water leaves you with a healthy, sparkling, party-ready pool or spa. 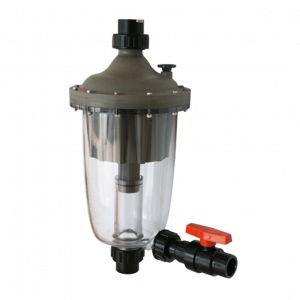 It’s the perfect addition to any filter system because it’s easy to clean, you simply open the purge valve. And, because it has a transparent cylinder, the slurry build-up can be easily monitored. Since the slurry is removed beforehand, the cartridge filters are not subjected to heavy-duty filtration, extending their lifespan and resulting in an extra clean, crystal clear pool. Reducing the backwash frequency can drastically reduce the need for pools to be topped up with fresh water. The Multicyclone centrifugal water filter will re-filter and clean the same pool water, effectively saving over 6500 litres of water. Nicole is on hand to give you advice on our range of Waterco centrifugal pre-filters and which are best suited to your pool. Our multicyclone centrifugal pre-filter are available for online orders. Free delivery to your home or office door, simply click on the ‘buy now’ button and follow the prompts. You will receive dispatch confirmation, which you will need to keep for tracking purposes. Browse our website for information on, and to order, our top-selling products. We live up to our name and offer you the best prices. We’re based in Perth and supply customers throughout Western Australia. Call or email Nicole for premium service and excellent customer care. We do not supply outside Western Australia. Get in touch with Nicole today who is always on hand to chat to you about your centrifugal water filter requirements.